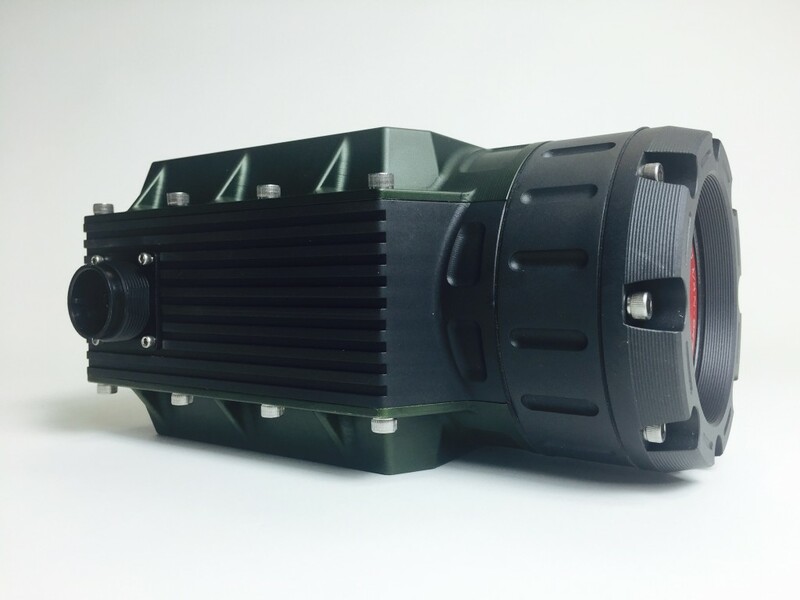 SPI Offers custom integration for the Canon ME20F-SH, housings, PTZ Pan Tilt Zoom Multi sensor platforms, UAV, DRONE All weather Packaging and a wide array of desirable options. Featuring an astonishing four million ISO rating, the Canon ME20F-SH Multi-Purpose Camera captures video at up to 1920 x 1080p 60 and supports both NTSC and PAL broadcast frame rates. The camera incorporates a full frame 35mm-sized sensor with approximately 2.26 million pixels. This results in a pixel that is about 7.5 x larger than the pixels on optional Canon Full-frame DSLR cameras, which provides for camera’s notable ISO rating. Incorporating a Canon DIGIC DV 4 image processor, the camera supports 12 stops of dynamic range, and features Wide DR and Canon Log gamma profiles that protect highlight and shadow detail. The camera body is small in size and features 2 x HD/3G-SDI outputs, and a single HDMI output. The camera incorporates a Genlock-in for integrating this camera into a multi-camera shoot. Although small in size the ME20F Multi-Purpose camera features a locking Cinema EF Lens mount. This small box sized camera is versatile and can fit into smaller spaces. You can use optional accessories to configure the camera for a variety of applications. The camera’s sensor feature photosites that measure 19 micrometers, which is 7.5 times larger than the photosites of the nominal Canon 35mm DSLR sensor. This allows the camera to provide excellent low light performance. This is an HD camera body only and is capable of capturing 1920 x 1080 footage at 59.94P / 59.94i / 50.00P / 50.00i / 29.97P / 25.00P / 23.98P. Professional connectivity includes the HD/3G-SDI connectors and genlock input, allowing the camera to be easily integrated into a multi-camera workflow. The OSD is available on both the HDMI and the first SDI output. The camera features a built-in filter stack including a clear filter, an ND 1/8, and an ND 1/64, as well as an IR cut filter, this allows you to choose to use the IR cut filter much as you would choose from the built-in ND filters. The camera features built-in One-shot AF, and Push Auto Iris. The One-Shot AF assists in focusing adjustment with a dedicated button. Focus status can be confirmed on an external monitor. Push Auto Iris automatically adjusts the aperture of the lens to quickly and easily maintain proper exposure, even in situations where lighting changes frequently. Most digital cameras these days boast of ISO levels along the 25,600 and 51,200 range. But have you ever heard of one that reaches 4,000,000? If you’re in the market for a multi-purpose camera, then you definitely will, because that is exactly what Canon’s new ME-20F-SH, it’s first ever such camera, promises. With a sensor that has 5.5 times the area of conventional high-end interchangeable lens cameras, this Canon shooter can not only see better in the dark, it can record in Full HD video too. The 35 mm full-frame CMOS on the Canon ME-20F-SH has pixels arranged over a 19 μm square, noted to be 5.5 times more in terms of surface area compared to the other high-end interchangeable lens cameras. This gives the camera a high sensitivity even in situations with only 0.0005 lux of brightness. In other words, in very very dark areas. This gives it an equivalent ISO of 4,000,000, exponentially more than current highest figures. While the camera itself might already be impressive given that feature, you can even extend it further using interchangeable lenses. The ME-20F-SH uses the same mount type as canon’s SLR and EOS lines, making it easy to pick out the right lens for the right occasion. 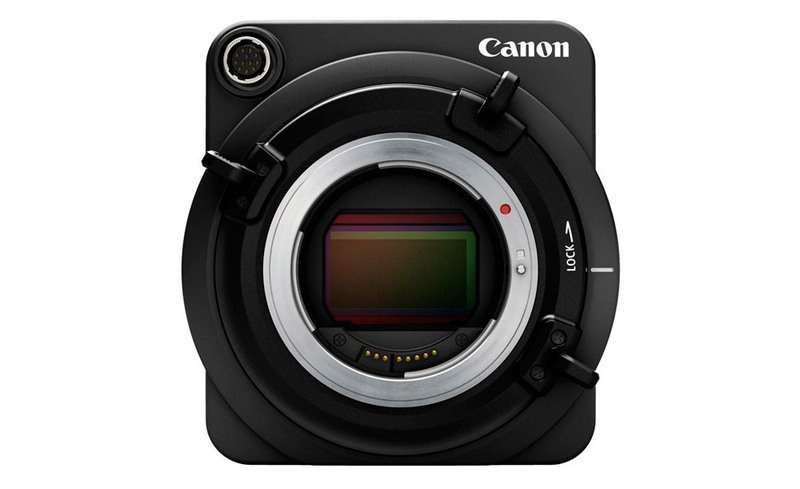 Design-wise, the camera isn’t probably going to win any words, looking more like an odd black box than a camera. It is, however, bursting with features, especially when you turn it around. The back is home to nearly a dozen ports, including 3G/HD-SDI and HDMI, 2.5 mm stereo mini-jack, and a round 8-pin RS-422 jack. 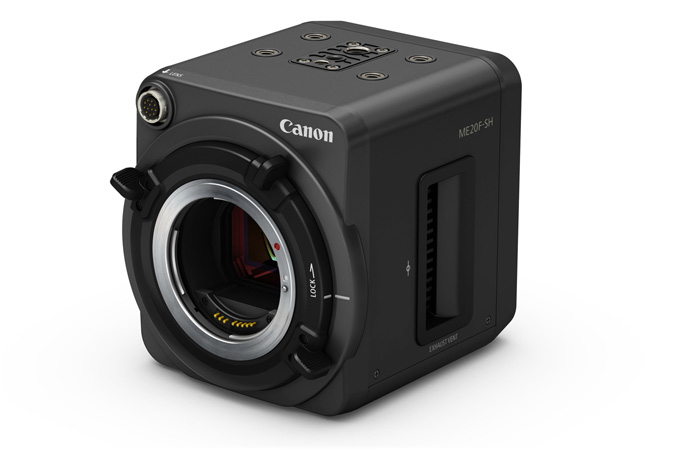 Canon has just taken the wraps off the ME20F-SH, a compact ‘multi-purpose’ professional video camera that’s built to shoot in ‘extremely low light’ with a top ISO in excess of 4 million. Yes, you read that right, 4 million ISO. To put that in perspective, full moon on a clear night is about 0.27 to 1.0 lux, and 0.0001 lux is a moonless, overcast night. This means that the ME20F-SH can shoot objects that even the naked eye cannot see (objects lit by less than 0.0005 lux of illumination) in 1080p or Full HD at 60fps. Although the resolution is nowhere close to what we call professional quality these days, what with even 4K being passe and Red announcing the Weapon with a 6K sensor, this low-light abilirty means that gives hithertho unheard of low-light performance to professionals like documentary filmmakers and wildlife researchers. Professionals filmmakers know how hard it is to shoot during the night. Most of the time, a single light source isn’t enough. However, the three-point lighting format may not also work as it would be too bright and can defeat the authenticity of a night scene. Production crews often resort to more expensive light set ups that are specifically designed for dark scenes. With the new Canon low-light camera, a single light source may be enough. It is also particularly useful for shooting dark scenes where the subject’s face is used for contrast. As for wildlife videographers, some animals are nocturnal and can be hard to spot during the day. In the night, using a lot of artificial light will drive these animals away. With the new Canon, a small light may just be used to reduce the chances of animals running off, ruining a shot. The secret to the ME20F-SH’s low-light ability is the size of the pixels on the 35mm full-frame CMOS sensor. They’re more than 5.5 times larger than the pixels found in high-end cameras with interchangeable lens. At 2.26 megapixels, it is certainly not photography-friendly, but what makes it unique is that each pixel measures 19 microns, which is 7.5-times larger than the ones in Canon’s EOS 1Dx DSLR. Noise is an obvious concern at such high sensitivity, and it’s especially so when the pixel size increases, but Canon says it’s employing proprietary technologies in the sensor and readout circuitry for noise reduction; noise won’t be completely eliminated, but it’s controlled. The camera allows users to discern subjects under even some of the dimmest lighting conditions, such as environments lit by artificial illumination or under a moonless night sky. As for connectivity options, the ME20F-SH utilizes output-only 3G/HD-SDI BNC and HDMI terminals for sending video to external video recorders and monitors. In other words, there’s no internal recording for video. For audio capture, it has a 3.5mm stereo mini-jack for an external microphone. Remote control is supported via a 2.5mm stereo mini-jack or a round 8-pin jack for RS–422, and the ME20F-SH is compatible with Canon’s RC-V100 Remote Controller. The Camera, which has pixels measuring 19μm – 5.5X larger than what’s found on high-end DSLRs. This allows for 1080/60p/30p/24p (and PAL equivalent) video capture in light levels as low as 0.0005 lux at a maximum gain setting of 75 Db, which is equivalent to over ISO 4,000,000. As with the company’s professional cinema cameras, Canon Log and Wide DR modes are available for capturing a wide dynamic range. The ME20F-SH supports EF and EF-S lenses with a locking mechanism and autofocus support. There are built-in neutral density and IR cut filters, both of which can be disabled if desired. As one would expect, the ME20F-SH has virtually every port imaginable. There are output-only 3G/HD-SDI and HDMI ports and both a 2.5mm mini-jack and an 8-pin RS-422 port for using Canon’s remote controls. There’s also a 3.5mm jack for a stereo mic as well as GENLOCK port for synchronizing multiple video sources. A microSD slot is used solely for firmware updates. The camera can be controlled on an external monitor using a rear-mounted joystick and the five buttons that surround it. The ME20F-SH could prove to be a useful tool for filmmakers, either as a specialty camera or as a regular production tool for certain applications. Filmmakers needing to shoot the occasional scene in near-total darkness while maintaining accurate color will benefit from the insanely high ISO. And, the camera could be useful in production environments such as reality TV or for documentary filmmaking in low light. The new ME20F-SH, which delivers exceptionally high sensitivity to capture Full HD video with a minimum subject illumination of less than 0.0005 lux1 (at maximum 75 dB gain setting, equivalent to an ISO sensitivity of over 4,000,000). Nighttime surveillance and security, cinematic production, reality television, and nature/wildlife documentaries are just some of the ME20F-SH’s many possible usage applications. With the ability to capture color video in extreme low-light conditions and its simplistic and versatile design, the ME-20F-SH Multi-purpose Camera can be easily incorporated into existing infrastructures and systems to provide high-quality video capture even where subjects might not be seen with the naked eye. 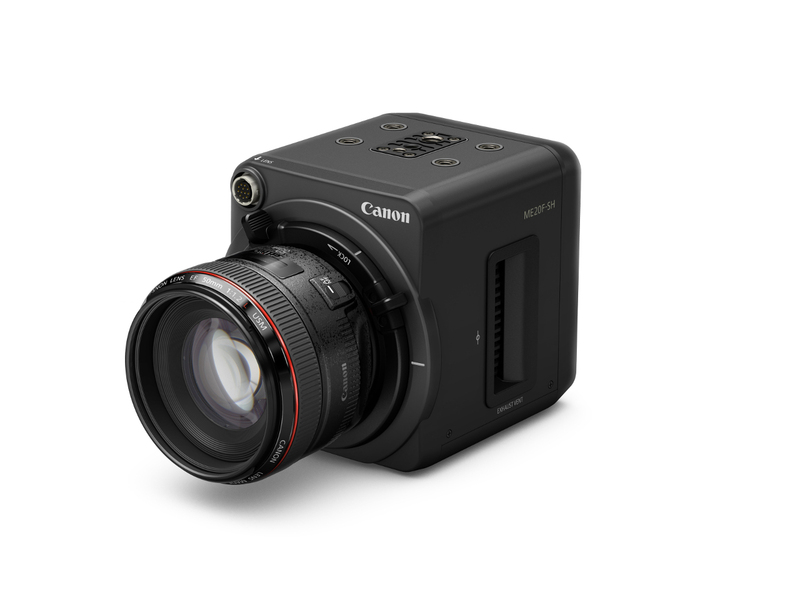 Canon’s new multi-purpose camera employs an enhanced version of the 35mm full-frame CMOS sensor for Full HD video use that was originally developed by the Company in 20132. Its compact, modular body design allows easy custom configurations for diverse usage scenarios. While capturing video in extreme low-light conditions often requires the use of infrared illumination (a technique that only yields video in black and white), the ME20F-SH camera achieves impressive high-sensitivity performance enabling the capture of color Full HD video with reduced noise in low-light conditions without the need for infrared illumination. The ME20F-SH camera’s CMOS sensor has pixels measuring 19 μm square3, which is more than 5.5 times the surface area of the pixels on the CMOS sensor featured in select top-of-the-line interchangeable lens cameras4. Furthermore, the sensor’s pixels and readout circuitry make use of Canon proprietary technologies to achieve both reduced noise and exceptionally high sensitivity on subjects with a minimum illumination of less than 0.0005 lux. This multi-purpose camera allows users to discern subjects under even some of the dimmest lighting conditions, such as environments lit by artificial illumination or under a moonless night sky. Furthermore, similar to Canon’s Cinema EOS System of professional digital cinematography cameras, the ME20F-SH camera includes Canon Log and Wide DR, which make possible a wide dynamic range, delivering high-image-quality video results across a range of illumination environments, from low- to brightly lit conditions. The new 1080p camera is aimed at a number of different markets, including nighttime surveillance/security, cinema, reality TV, and nature/wildlife documentaries, just to name a few, and it comes with a positive-locking EF mount and features Canon Log and Wide DR for maximum recorded dynamic range. While capturing video in extreme low-light conditions often requires the use of infrared illumination (a technique that only yields video in black and white), the ME20F-SH camera achieves impressive high-sensitivity performance enabling the capture of color Full HD video with reduced noise in low-light conditions without the need for infrared illumination. This multi-purpose camera allows users to discern subjects under even some of the dimmest lighting conditions, such as environments lit by artificial illumination or under a moonless night sky. Furthermore, similar to Canon’s Cinema EOS System of professional digital cinematography cameras, the ME20F-SH camera includes Canon Log and Wide DR, which make possible a wide dynamic range, delivering high-image-quality video results across a range of illumination environments, from low- to brightly lit conditions. …With such features Canon is surely trying to corner the surveillance, reality show, industrial and wildlife documentary applications. This camera is definitely not meant for every day shooting, but rather a very niche product for specific types of shoots. Specialist rental houses should be getting on the phone with their Canon rep about this product right about now.Canon is flexing their engineering muscles as this is no infrared camera – on the contrary, with such low-light performance, the ME20F-SH should be able to deliver some pretty staggering footage in natural light or lack thereof in full color and not black and green. EXCEPTIONAL LOW LIGHT PERFORMANCE The ME20F-SH Multi-Purpose Camera features a newly developed Canon full frame 35mm CMOS sensor with an equivalent sensitivity in excess of 4,000,000 ISO. Able to capture full color 1080p video up to 60fps, the ME20F-SH camera is ideal when shooting in extreme low light environments. The 35mm full-frame CMOS image sensor was specifically developed to shoot Full-HD video in low light, by increasing the light-sensing surface area of each pixel on the sensor. Photo sites measuring 19 micrometers square allow for exceptional low light performance, with a minimum subject illumination of below 0.0005 (at maximum 75 dB gain). The ME20F-SH Multi-Purpose Camera was designed specifically with many mounting points along the top and bottom of the camera to allow the freedom for users to customize the rigging of the camera for almost any purpose from a minimal compact size to a fully rigged configuration. The ME20F-SH Multi-Purpose Camera is compatible with Canon’s line of EF mount lenses. without the need to rotate the lens barrel. This facilitates changing lenses in applications where multiple accessories are attached to the lens. for additional information, customization and discounted pricing.